If the govt expects Trump to turn solicitous of India’s interests after presiding over a Republic Day parade, it is clearly out to lunch. As US President Donald Trump embarked on his controversial England tour, it was learnt that New Delhi has invited him as the chief guest for the Republic Day parade in 2019. Even for a government that routinely confuses foreign policy with public relations, this is a chancy move. After all, Trump has a well-developed reputation for enjoying the pageantry while simultaneously befouling his hosts from a high altitude. Yet the invitation casts into sharp relief the Prime Minister’s faith in the power of his personal diplomacy as well as his desire for a special relationship with the United States. It also underscores the government’s continuing inability to get the measure of US policies under Trump. Recall the lengths to which the government went in order to forge such a special relationship during the Obama administration. In Narendra Modi’s first prime ministerial visit to the United States in September 2014, India signed a joint statement aligning itself with the American stance on the disputes in the South China Sea. During President Obama’s 2015 visit to India for Republic Day, the two countries issued a joint strategic vision statement on the Indian Ocean and Asia-Pacific Security. This effort to tilt sharply towards the United States and against China, however, required further concessions on India’s part. The Americans had felt hard done by after the US-India nuclear deal owing to India’s laws on the liability of suppliers in the event of accidents. The Modi government pacified the American sensitivities by signing an international convention that squarely contradicted key provisions of the Indian law. India also concluded a logistics support agreement, as long desired by the Pentagon. The Obama administration, in turn, designated India as a ‘major defence partner’ eligible for technology transfer on a par with its ‘closest allies and partners’. Narendra Modi grandly announced to the US Congress in June 2016 that there was a “new symphony in play”. Little did he anticipate that the music sheet would abruptly be changed only a few months later. Even during the Obama administration, in fact, it was evident that the India-US relationship was misshapen. While India hitched its wagon to America, there was little to show by way of strategic technology flows to India– even the projects under consideration were utterly modest. What’s more, while the government talked up the strategic relationship, economic ties—both bilateral and multilateral—showed little progress. Negotiations on the totalisation agreement and bilateral investment treaty languished even as India remained on Washington’s intellectual property rights watch-list. The Obama administration paid no more than lip service to India’s desire to join the Asia Pacific Economic Cooperation forum. Worse, the administration was pressing ahead to conclude the Trans-Pacific Partnership (TPP)—an upgraded free trade agreement with key Asia-Pacific economies that was aimed at China but excluded India. Had the TPP gone through, India would have been confronted with an array of non-tariff barriers in trading with some of the most dynamic economies. 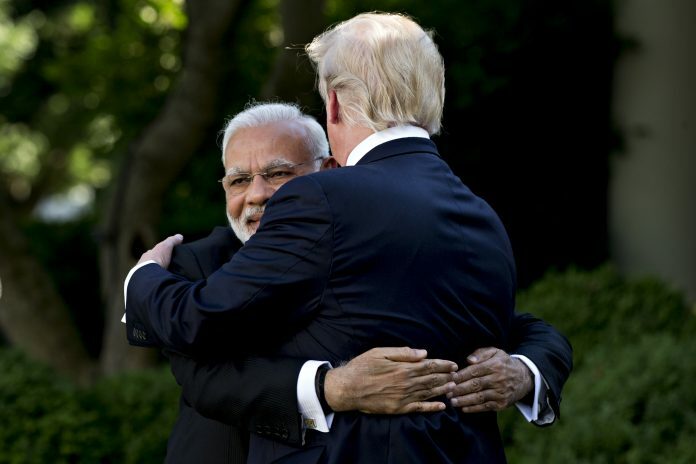 With the Trump administration, though, it has become increasingly difficult for New Delhi to brush aside thorny economic issues while burnishing the promissory plaque of a special relationship. Though Trump has been willing to accord India a place in American strategy for the Indo-Pacific and even in Afghanistan, he has made it clear that India owes this to the United States because of the trade surplus that it enjoys. More pointedly, the Trump administration has identified India as one of the key countries with which American trade balance has to be rectified, and has placed India on an exchange rate watch-list for good measure. He has publicly called out India’s import duties on American products such as Harley-Davidson motorcycles and ridiculed the Modi’s moves to reduce them as inadequate. If the Indian government is unable to learn from its own experience of dealing with Trump, it could pay attention to the treatment handed out to close American allies in the G7 and NATO, not to mention Britain whose special relationship with the United States is under greater strain than ever before. The Modi government errs if it believes that it can finesse the consequences of this shift in US policy by personal diplomacy. The reality is that the Trump administration’s attitude towards India departs sharply and fundamentally from those of presidents George W. Bush and Barack Obama. The Bush administration had sought to build a new relationship with India on the premise that it was in the United States’ strategic interest to enable India’s rise as a major power—even if India was unwilling to contribute directly to the preservation of American hegemony in Asia and beyond. As China’s rise acquired momentum in the wake of the 2008 financial crisis, the Obama administration pushed further in this direction. This was not, as noted earlier, an unproblematic relationship. The United States’ fundamental attitude towards India masked these strains. Trump, by contrast, believes that the United States has borne too heavy an economic burden in enabling the security and prosperity of its allies and partners. Everyone has to pay their share of the bill at the end of the meal. His style is often described as ‘transactional’, but in fact, it is based on very different premises from those of his predecessors. Again, this is not unprecedented in the United States’ recent history: think of Richard Nixon’s move in 1971 to abandon the Bretton Woods system of fixed exchange rates without consulting allies, let alone others. Trump has gone much further in pulling out of the Paris Accords, demanding renegotiation of trade agreements, slapping tariffs all around, and tearing up the nuclear agreement with Iran. If the government expects Trump to turn solicitous of India’s interests after presiding over the pomp of a Republic Day parade, it is clearly out to lunch. As America’s closest allies have realised, pandering to Trump is useless and counterproductive. Srinath Raghavan is a Senior Fellow at Centre for Policy Research. One more drama by Modi ji. When crores of youth are unemployed, thousands of farmers dying, lakhs of villages do not have drinking water, every day citizens are being lynched in broad daylight, every day one or the other are fleeing out of country by swallowing public money,OUR GREAT PM MODI JI IS DYING HARD TO TAKE CHHABI OF TRUMP. WHAT AN IRONY. Country will never forget such a great PM. For the true potential of the India – US relationship to be realised, going beyond a shared concern over the rise of China, our economy should be doing very much better than it is. TPP was not closed to India, any more than RCEP is. It is we who have been diffident in signing a free trade agreement with the EU. It is when India’s per capita income is about $ 6,000 that we will begin to count in global affairs. 2. President Trump’s visit to Britain should be kept in mind while planning his Republic Day state visit. All the relevant parameters should be carefully worked out and agreed upon. His press conference in Helsinki should sensitise us to the challenges of engaging his administration productively.